Due primarily to the urging of members of the local curling club, who had visited Canada to enter bonspiels, a meeting was held in Eveleth March 2, 1916 to discuss the erecting of an indoor sports building to house curling sheets and a skating rink. The location of the structure, most prominently mentioned, was the corner of Garfield and Adams streets. Groups present at the meeting were the school board, the curling club, and the city administration. World War I interfered with immediate plans to erect the building and it was not finished until 1919. The building, which featured a curling rink on the first floor, and a skating rink on the second floor, cost $125,000, a large sum of money for the time. The rink opened for use January 17, 1919. It was the first modern recreation building built on the Mesabi Range. Within a few years Virginia, Hibbing, and Chisholm had followed by constructing similar buildings. Leonard Peterson and C.H. 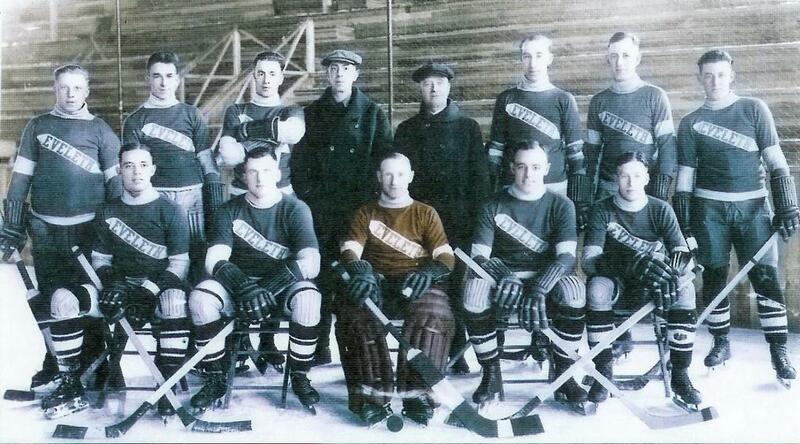 Hale were instrumental in launching the 1919-1920 Eveleth hockey team. The team played their first game in conjunction with the Winter Carnival in the new Recreation Building on January 1, 1920, defeating Hibbing 5-2. 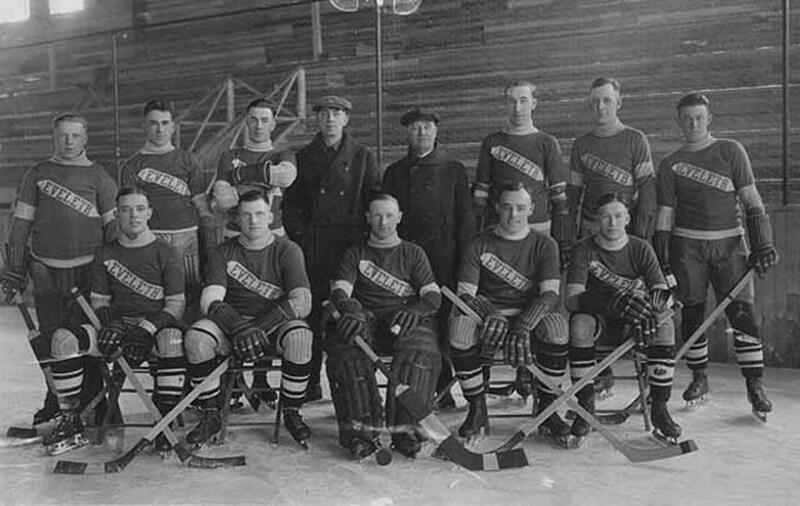 Members of the team, many of whom were from Two Harbors and Duluth were as follows: Clark, Hedberg, Stein, Couture, Toppula, Sullivan, Le Fleur, Bastien, and Seaborn. Seaborn was from Canada, and was the first of many Canadiens that Eveleth was the import the next six seasons. Playing an independent schedule the tam finished the season of 1920 with 18 wins, 5 losses and 1 tie. Teams met included St. Paul, Hibbing, Duluth, Calumet, Rainy River, Virginia, and Winnipeg. Pathe News, a national news service, showed films of the hockey team and Winter Carnival in conjunction with the opening of the building January 1. 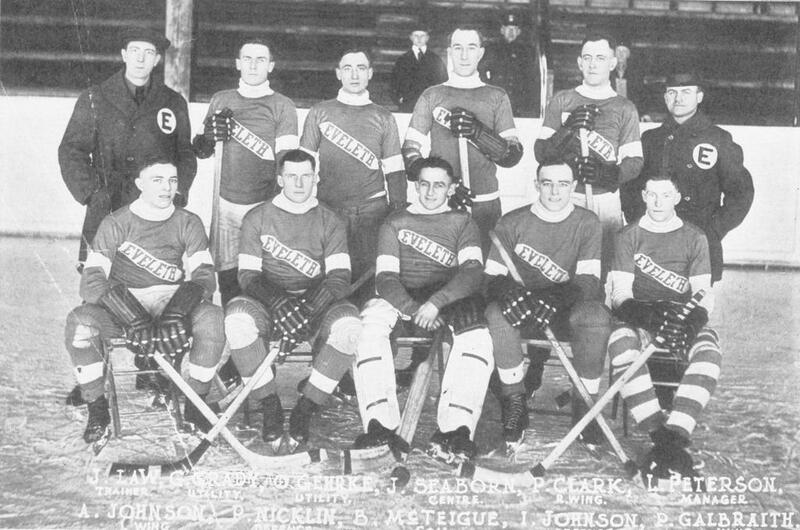 For the season of 1920-1921 Eveleth, known as the Reds, joined the United States Amateur Hockey Association as a member of Group 3 along with Calumet, Houghton, American Soo, and Canadian Soo. This season, the first for six man hockey, proved to be a very successful one for the team. For the 1920-1921 campaign the team was greatly improved from the predecessor with the importation of several Canadian players, among them Ching and Ade Johnson, Perk Galbraith, Denny Breen, Percy Nicklin, and Vic Des Jardins. The latter was a native of Sault Ste. Marie, Michigan. Eveleth captured the USAHA Group 3 title with a 13 win and 1 loss record. In addition, several exhibition games were played against stronger teams than those in Group 3. In the national playoffs Cleveland of Group 2 defeated Boston of Group 1 in a four game total goal series by a score of 10-8 at Boston and Cleveland. 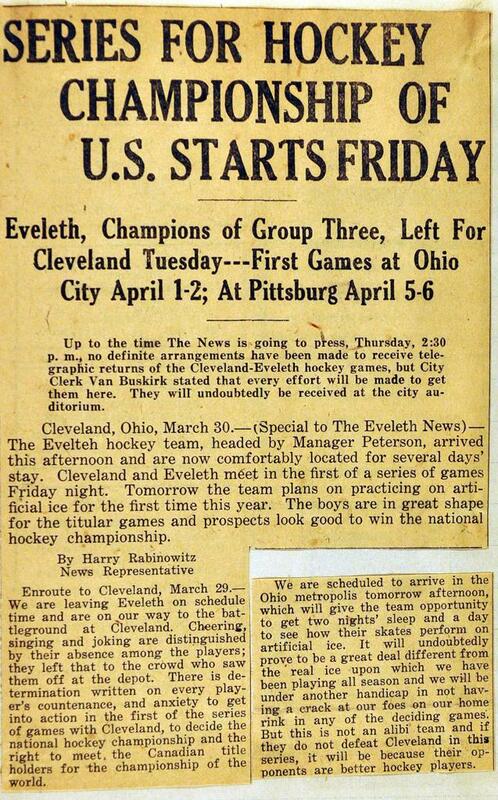 In the national finals in a four game total goal series played at Cleveland and Pittsburgh, Cleveland edged Eveleth by a score of 14 goals to 12. 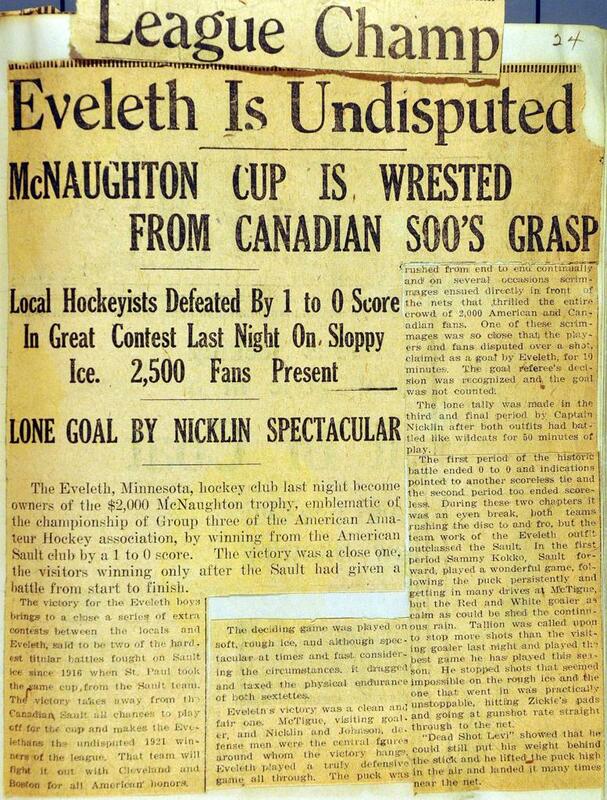 The Eveleth team also won the coveted MacNaughton Cup by defeating American Soo 10-1. The public began asking, "Where is Eveleth? ", "How do you pronounce Eveleth? ", and "What is the population of Eveleth?" During the season of 1920-1921 interest in the team skyrocketed in the east end of the Mesabi Range. 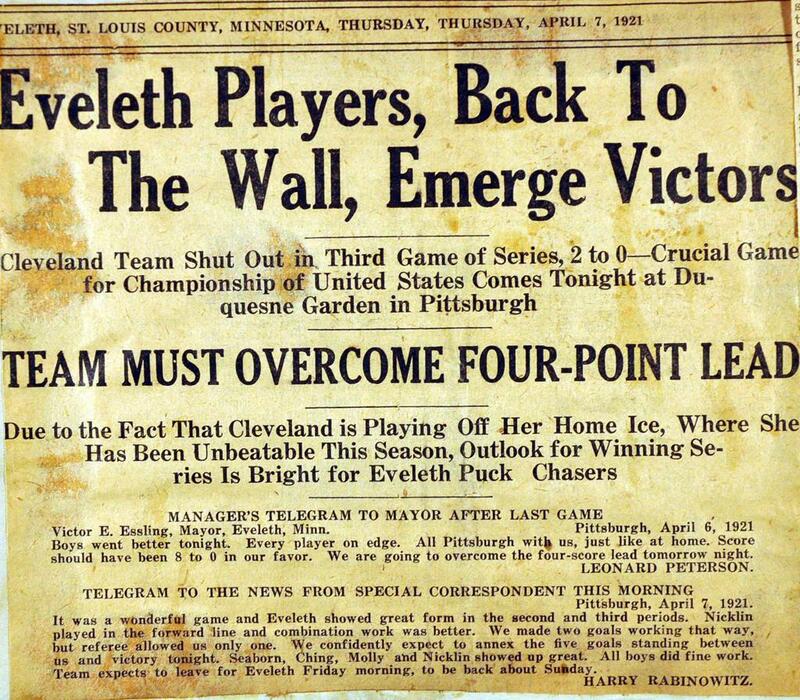 An estimated crowd of 1,000 stood outdoors in the cold at the local Western Union office awaiting details of the Eveleth-Cleveland playoff games being played in Cleveland, and Pittsburgh. In as much as the Eveleth rink did not possess artificial ice, late season games had to by played at the opponent's rink or at a neutral site. The interest created in the Reds led Mayor Essling to promote a second and larger building devoted entirely to hockey and skating. Essling, a native of St. Peter and a lawyer, was a first-rate promoter and developer. The new building, with an ice surface of 190' x 90' and a seating capacity of near 3,000, was built during the summer of 1921. Before the structure was completed a number of entangling lawsuits were filed which questioned the City of Eveleth's right to construct or operate the building. These issues became a "hot political potato" in the city. However, nothing came of the suits and the Hippodrome was opened January 1, 1922 before a full house as the locals defeated the Duluth Hornets 10-6. 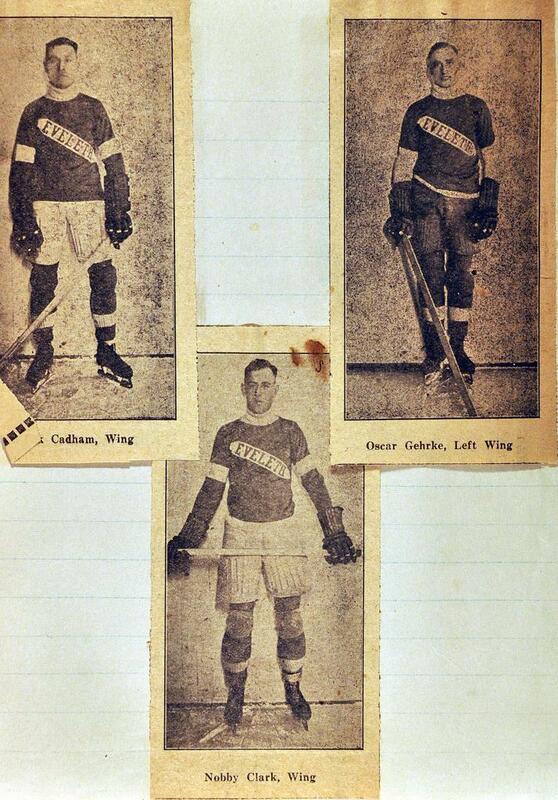 For the season of 1920-1921 the Eveleth Reds continued to compete in the USAHA Group 3 with American Soo, Calumet, Canadian Soo, and Houghton. Eveleth represented Group 3 in the USAHA playoff and met St. Paul AC in the semi-final playoffs. In a memorable series Eveleth was defeated by St. Paul of Group 2 seven goals to six in a five game series. Two of the games ended in 0-0 ties, while St. Paul won two games and lost one. Eveleth was not satisfied with the USAHA placing them in a league with the weak Michigan teams and asked to be placed in a group with the large cities and stronger teams. The groups in the USAHA were re-organized for the season of 1922-1923, reducing the three groups to two. The Eastern Group contained teams from Boston, New York, and New Haven, while Eveleth joined Cleveland, Pittsburgh, St. Paul, Duluth, and newcomer Milwaukee in the Western Group. After the 1921-1922 season the Upper Michigan and Canadian Soo teams dropped out of the USAHA. 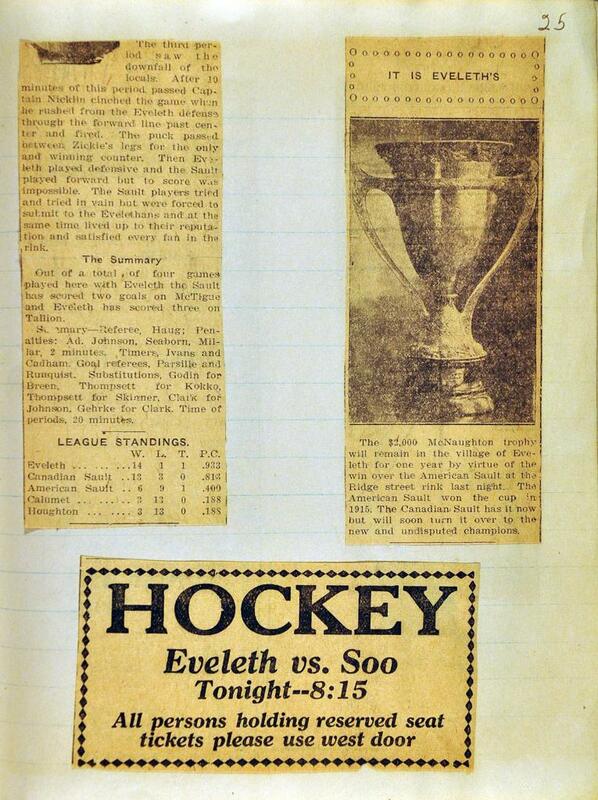 Eveleth finished the 1922-1923 season in third place with a 11 win and 9 loss record. St. Paul won the Western Group title and in the national finals lost to Boston at Boston in a close four game series six goals to four. 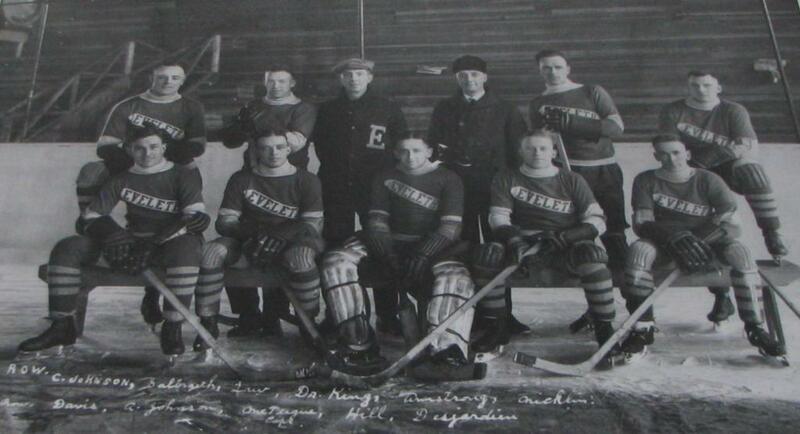 Members of the 1922-1923 Eveleth team were Bernie McTigue, Ching and Ade Johnson, Percy Nicklin, Billy Hill, Perk Galbraith, Vic Des Jardins, Bob Davis, and Bob Armstrong. In the spring of 1923 the City of Eveleth, its officers and the city's bonding and surety company were sued in district court in Virginia for paying salaries out of city funds to its baseball and hockey players. Apparently, nothing came of the allegations. Minneapolis replaced Milwaukee in the league for the following season if 1923-1924. Each team played a twenty game schedule and Eveleth finished fourth in the six team circuit with 9 wins and 11 losses. In the western playoffs Pittsburgh defeated St. Paul and Cleveland and continued on to win the national crown. The popular Ching Johnson, a favorite with the Eveleth fans and those around the league, and his brother Ade left the Eveleth team after the 1922-1923 season to join the newly formed Minneapolis sextet. 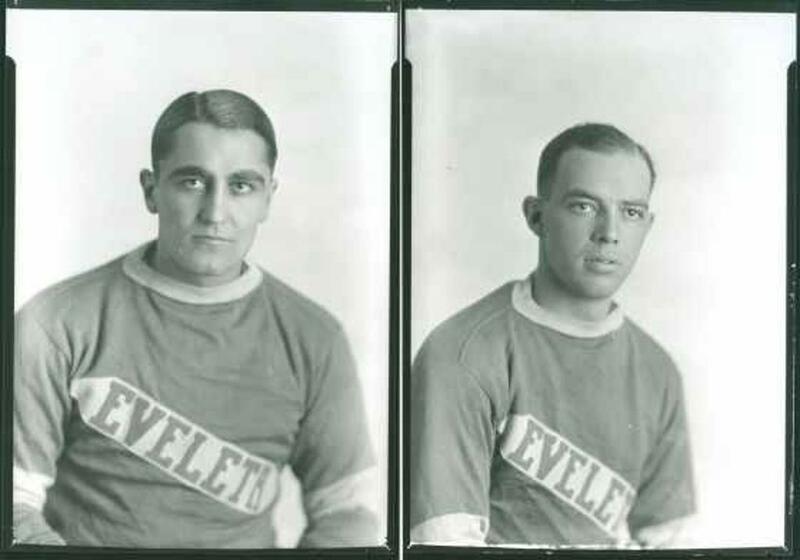 Newcomers added to the Eveleth roster for the 1923-1924 season were Herbert, Reise, Rodden, and Clark. The season of 1924-1925 proved to be the last for the USAHA. The same six teams as in the previous season comprised the Western Group, but the schedule was doubled from twenty games to forty games and divided into two halves of twenty games each. In the first half they completely reversed their form and captured the second half title. 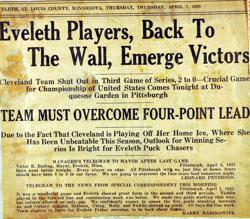 In the Western playoffs, Pittsburgh, first half winner, defeated Eveleth three games to none. Pittsburgh then won the overall USAHA crown by defeating Fort Pit of the Eastern Group three games to one. Rodden and Galbraith led the Eveleth team in scoring for the season. 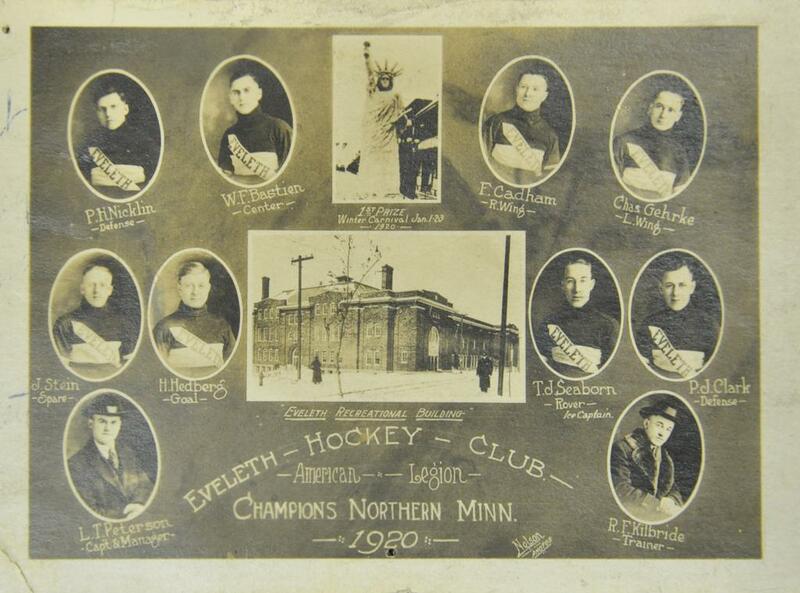 The last season of "Big Time" hockey for Eveleth was that of 1925-1926. For that season Pittsburgh and Cleveland withdrew from the league. Pittsburgh, with almost the same lineup they had the previous season in the Western Group, joined the National Hockey League. 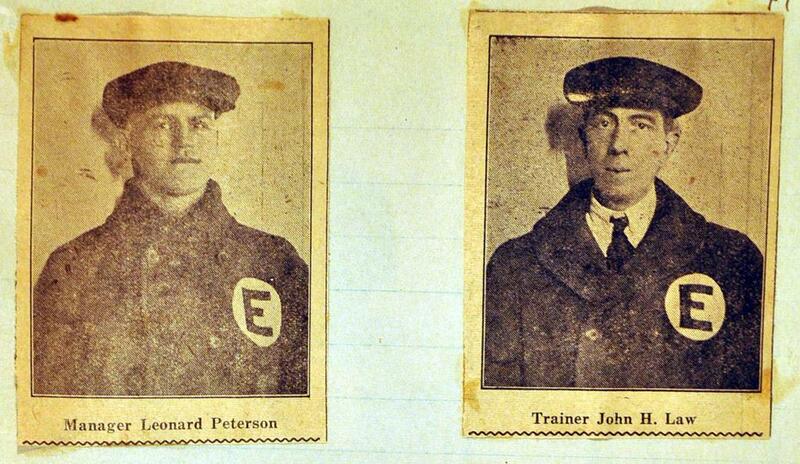 Eveleth and Hibbing joined forces to form one team known as the Eveleth-Hibbing rangers. The Rangers along with newcomers Winnipeg and Canadian Soo joined holdovers St. Paul, Minneapolis, and Duluth to form the re-named Central Hockey Association. The USAHA, of which Eveleth had been part since 1921, ceased to be an active organization, either in the East or in the West, and left amateur hockey in the United States without a governing body. Eveleth-Hibbing got off to a good start in the CHA, but bogged down in med-season and finished in fifth place, behind St. Paul and ahead of the Soo. Minneapolis, Duluth, and Winnipeg engaged in the playoffs, with the Minneapolis rockets emerging as the playoff champions. 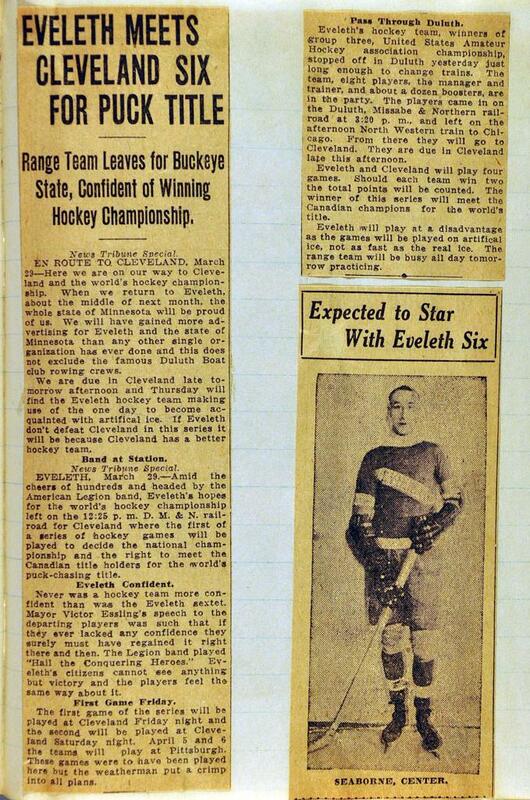 Thus, after the spring of 1926 and after six seasons of top level "amateur" hockey, the best in the world with the exception of the major league, the end of the route came for the Eveleth franchise. No longer would fans of the Mesabi Range see some of the best players in the world such as Tiny Thompson, Taffy Abel, Nels Stewart, Lionel Conacher, Herbie Lewis, Mike Goodman, Bill Cook, Bun Cook, Ching Johnson, Moose Goheen, Herb Drury, Vern Turner, Frank Galbraith, Roy Worters, Coddy Winters, Moose Jamieson, Mickey McQuire, and Hib Milks. 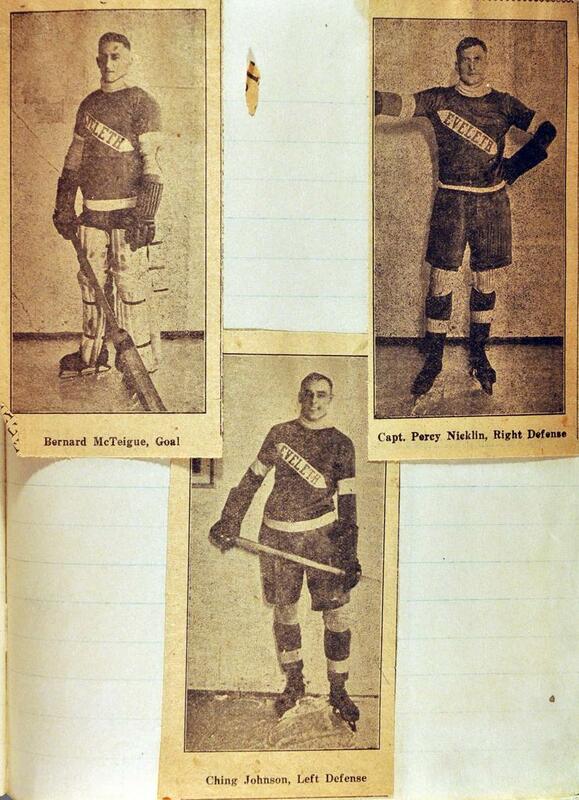 High operating costs and the problem of protecting players from raids by professional hockey forced the Central Hockey Association to suspend operations after the 1925-1926 season. For the following season of 1926-1927 the league was organized as an outright professional circuit with a working agreement with the National Hockey League. Eveleth-Hibbing did not join the new professional league as the American Hockey Association. 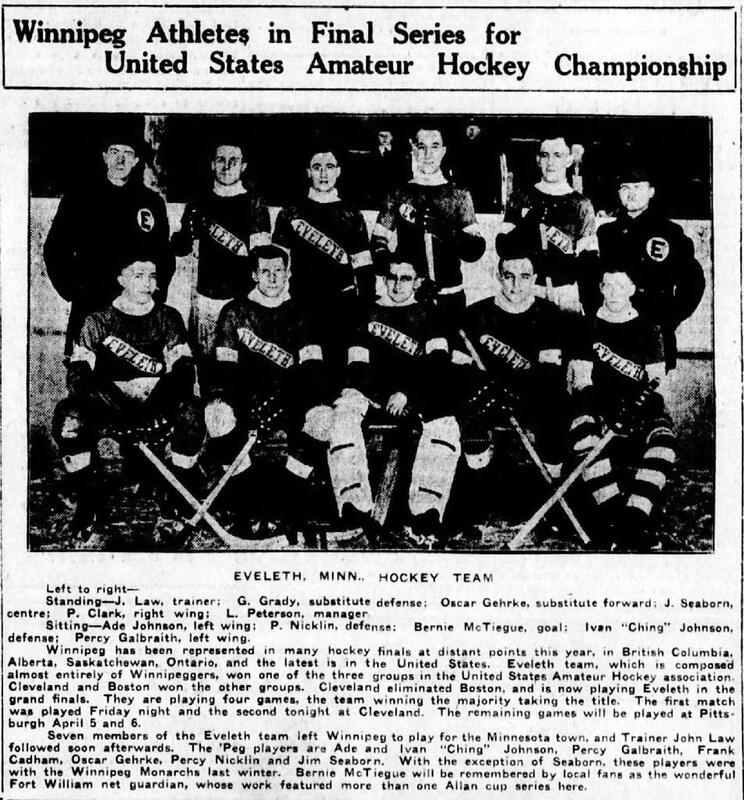 Thus ended for Eveleth the era of importation of Canadian players and an opening for the locally produced player to play on the Ranger sextet, albeit at a lower level of competition.